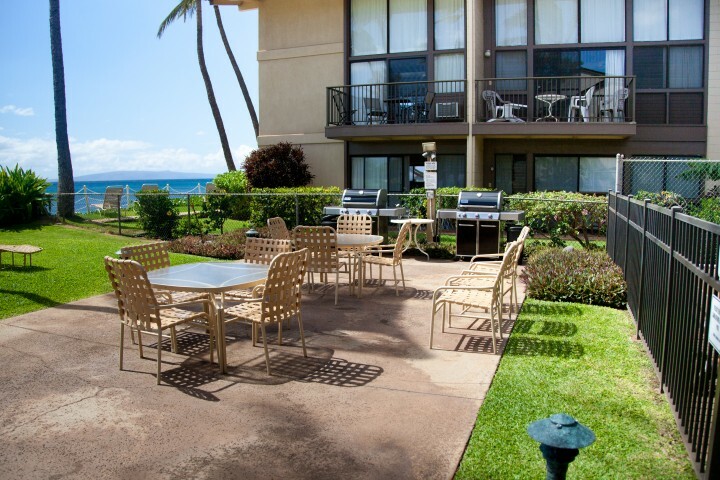 Our wheelchair accessible condo is located in the oceanfront complex of Makani A Kai on the island of Maui. Ours is a ground floor unit with easy wheelchair access. Large open living room is nicely decorated in a Hawaiian motif and has an exotic Hawaiian Island wall sculpture. Tile floor for easy wheeling. Large master bedroom with kingsize bed has wheelchair access from both sides. Large wheelchair accessible bathroom with roll in shower ensuite to master bedroom. Grab bars in shower for safety and stability. Roll under sink with lots of counter space. A purpose built raised area allowing better ocean views from a wheelchair or scooter. Bruce and Amy Bernhardt invite you to experience the ALOHA OF MAUI and discover the beauty and tranquility of Ma’alaea, Maui. Bruce is a C5/6 quadriplegic and we have set up a wheelchair accessible condo in a Hawaiian paradise. We and other disabled people know that a good holiday for the disabled person starts with good accessibility. If accessibility is hard, then the disabled person cannot relax and totally enjoy themselves. I am not talking about wheelchair accessibility that an able bodied person says is accessible but TRUE wheelchair accessibility. Our condo is a ground floor, 2 bedroom 2 bathroom unit with an accessible bathroom that has a roll in shower, roll under sink, grab bars by the toilet and in the shower, all contained within the master bedroom’s ensuite so you have total privacy from the rest of the unit. The accessible bathroom is big enough that you can turn around in a wheelchair, not like some other “accessible bathrooms” I’ve seen. The King-size bed in the master bedroom is on legs not a platform so guests who need to use a patient lift can access the bed and both sides of the bed are accessible for transfer. We just added as of January 2017 a new central A/C that works great for keeping the condo and especially the master bedroom and accessible ensuite cool on what can be muggy uncomfortable nights. These are details that I know after all these years in the chair that a non disabled person doesn’t. Both entrances are level entry with proper levered door handles, remote control ceiling fans, touch control lights, remote control drapes, and accessible dining table and computer table (not knee knockers). Details like tile floors, not carpeting, kitchen plates and dishes in lower shelves for easy access, not in the higher non accessible cupboards, and furniture placement to enhance maneuverability, not hinder it. Place all these details and more in a nicely appointed 2 bedroom 2 bathroom unit that can sleep 6 (4 adults and 2 children under 10) only 100 feet from the ocean on Maui and you have a truly fantastic holiday for anyone who is disabled or has a family member who is disabled. The unit itself is beautiful. Tile floors, new furniture with a tropical flair, remote control drapes and ceiling fans. Exotic wall sculpture of the Hawaiian island chain, 32 inch flat screen TV, and DVD. Free wireless internet and free telephone calls to the mainland and Canada. Newly renovated kitchen is well equipped with all the necessities like coffee maker, toaster, microwave plus lots more including rice cooker, coffee grinder and of course access to the complex’s 2 gas bbq’s which are oceanfront. The complex is small and private with only 24 units and is the last complex on the street and is right on the beach with sugarcane behind. This accessible home base allows you to explore and enjoy the magic of Maui which has been voted the number 1 island in the world for 20 years in a row by Conde Nast magazine. Other disabled support services available on Maui include accessible van rentals, medical equipment rentals and access to attendant care which make a holiday to Maui easy to plan. Other positive aspects of Maui, besides the tropical beauty, are that you are in the USA and protected by its laws (ADA) and no passports are needed for American citizens. There are direct daily flights from the North American mainland, you have access to a modern medical system and the true peace of mind that you can drink the water and that people communicate in English. If you are interested in traveling to Maui, please read our website as it contains lots of useful information about our condo and Maui in general and if you have further questions or want to reserve our condo for your dream vacation please contact us and we’ll help make it happen.